Virtually every car owner has oneOr a few unnecessary tires. Some immediately try to get rid of such seemingly unnecessary ballast. But do not rush to throw out old tires. Of these, you can make beautiful crafts that will decorate the yard, garden, flower garden, playground or dacha. Tire for cutting handicrafts is better cutLarge and fairly sharp knife. The process will simplify the electric jigsaw, if any. Be prepared for the fact that when cutting thick rubber can not break a single file. It is better to cut tires from big wheels with a Bulgarian. To slightly soften the rubber and facilitate the cutting, you can always wet it with soapy water. When choosing a material, it is better to stop on simple tires, without a steel mesh inside, otherwise you will spend a lot of time and energy cutting. 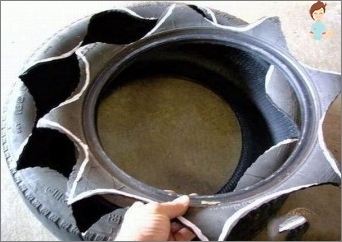 A very time-consuming procedure is the eversion of the tire. When you unscrew it halfway, press it so that an oval forms. Then the operation will be easier. What crafts can be made from old tires? Arrangement of a children's playground - swings, children's sandboxes, barriers. The unique look of the design of your garden will giveDifferent figures. These are all kinds of animals - bears and donkeys, birds - parrots and swans, different fabulous and animated characters, flowers and trees - everything that will allow you to create a fantasy. 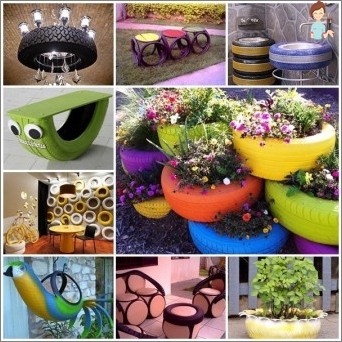 From old tires you can build yourselfBeautiful vases and flower beds. To do this, they simply install on the principle of the pyramid, fill the ground and plant the plants. Of the halves or whole automobile tires, wonderful pendant pots are obtained. Truck farmers use tires for various wicker plants, for example, for cucumbers. Many gardeners are spreading out the tires of the stairs. Crafts from automobile tires are widely used in suburban areas. They can decorate the fence, create various wicker country furniture (benches, sofas), use it as a base for the table. For comfortable seats, it is better to wrap the tireTape, and over wrap and glue the string. If you have a bicycle, you can create a parking lot. Some craftsmen manage to cover the roof of the house with the old tires at the dacha. And for all this, no circuits are used. 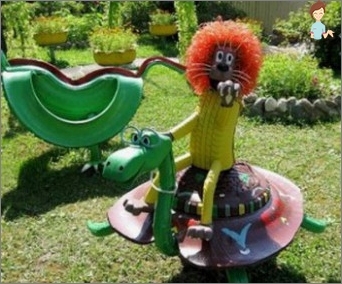 To bring fun and joy to kids will be craftsFrom tires for a children's playground. It is very simple to make a swing out of the tires - just tie the rope on the tree and fix it in the tire, for convenience you can install the seat. You can build various obstacles, climbing walls. Although you need to make a lot of effort, but this youGive children a real joy and a lot of positive emotions. An excellent option for a children's playground is the use of old car tires for sandboxes. The wheel is well cleaned of dust and dirt, paint in bright colors and fill with sand. Be sure to choose tires of large diameter, so playing the children will be much more comfortable. Deciding to create something from old tires, some include their imagination, others are looking for all sorts of schemes for some or other crafts from tires. In any case, know that the old tires areNot at all an extra ballast, as some believe, but a wonderful material for the creation of a variety of beautiful and practical handicrafts for the garden, garden, garden and playground. Give old tires a new life!